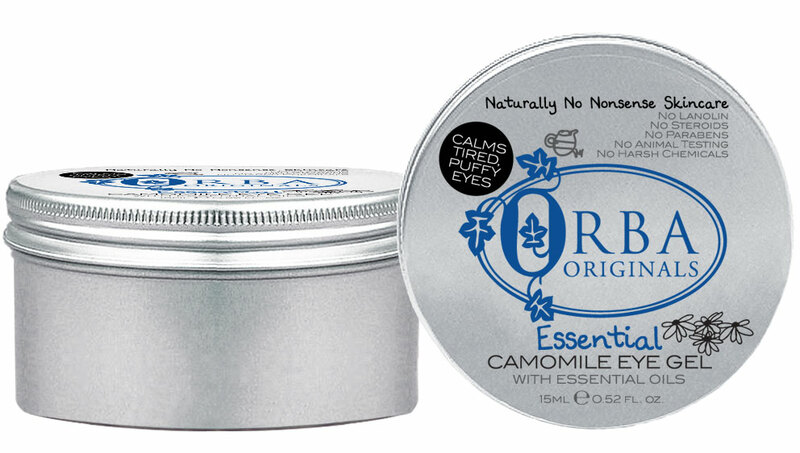 Essential Camomile Eye Gel Camomile Eye Gel  - £10.99 : Orba Originals - Naturally No Nonsense Skincare! For the relief of tired, puffy eyes, dark shadows and fine lines. An outstanding little remedy to combat troubled under-eye and surrounding areas. Gentle and effective, only a small amount is needed. Orba Originals' Soothing Camomile Eye Gel harnesses the naturally anti-inflammatory, healing agency for which the Camomile flower is widely renowned. The gel structure effectively retains water releasing it only once it is gently massaged into the skin. It's unmatched hydrating properties result in increased smoothness and gently conditioned and toned skin. Use twice daily, morning and night. Apply with clean fingers to freshly cleansed skin patting gently around the eyes with the index finger until absorbed. Aqua (Water), Glyceryl Acrylate/Acrylic Acid Copolymer (Vegetable Glycerine) Anthemis Nobilis (Camomile Extract), Fragrance (Naticide Preservative).